동·서 쌍탑의 경주 원원사지 동ㆍ서 삼층석탑은 사적 제46호 경주 원원사지 안에 있다. 원원사(遠願寺)는 삼국유사에 의하면 밀교(密敎)를 계승한 안혜(安惠)ㆍ낭융(朗融) 등이 김유신ㆍ김의원ㆍ김술종 등과 뜻을 모아 호국의 사찰로 창건하였다고 한다. 동ㆍ서 삼층석탑(높이 약 7m)은 도괴되어 있던 것을 1931년 가을(조선건축사론 중 경주를 중심으로 한 신라시대 일반형 삼층석탑론(건축잡지 1933.11월호. 藤島亥治郞)에 경주고적보존회에서 복원하였다. 두 탑은 같은 구조와 양식으로 조성된 2중 기단의 삼층석탑이며, 하층기단 면석과 갑석 및 상층기단 면석은 각각 8매, 상층기단 갑석은 4매로 구성되어 있다. 상·하층기단의 면석에는 2개의 탱주와 우주가 있고, 하층갑석의 상면에는 2단의 상층 기단 괴임이 있으며, 상층갑석 4면의 각 기둥 사이에는 연화좌 위에 앉아 있는 십이지상을 조각하였는데 이들의 머리는 짐승이나, 몸체는 평복을 입은 사람의 모습이며 옷자락이 하늘로 날리고 있는 형상이다. 1층 탑신석 이상 3층 옥개석까지는 모두 1매석으로 조성되어 있으며 1층 탑신에는 우주가 있고, 4면에는 갑옷을 입고 무기를 든 사천왕상이 조각되어 있다. 각 층 옥개석의 하면에는 5단의 옥개받침이 있고 상면에는 각형 2단의 탑신 괴임이 있으며 상륜부는 노반석과 앙화석이 남아 있다. 경주 원원사지 동ㆍ서 삼층석탑은 통일신라시대 석탑의 일반적 표현형식, 옥개석의 돌다듬기 수법, 기단부와 탑신부에 구현된 양식, 석재의 조립방법 등으로 보아 8세기 중엽에 조성된 석탑으로 추정되며, 하층기단에서 십이지상을 최초로 배치한 점 등 석탑의 조각기술, 구조적 특징, 표현양식 등을 고려할 때 학술적, 미술사적 중요한 가치를 지닌 석탑으로 평가되고 있다. 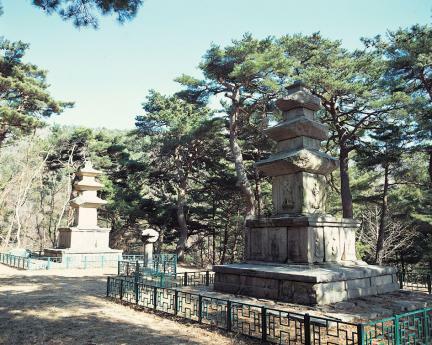 These twinned East and West Three-story Pagodas are located at the Wonwonsa Temple Site in Gyeongju (Historic Site No. 46). 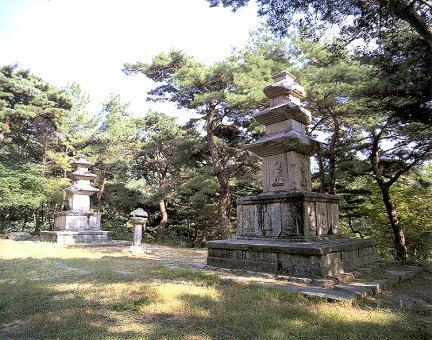 According to Samguk yusa (Memorabilia of the Three Kingdoms), Wonwonsa Temple was founded by Anhye and Nangyung, followers of esoteric Buddhism, together with Kim Yu-sin, Kim Ui-won and Kim Sul-jong, as a place to pray for national security. 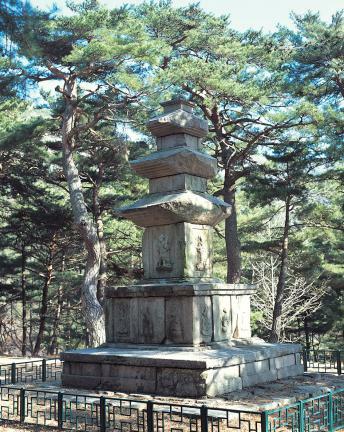 The east and west pagodas (approximately 7m high) were destroyed, and later restored by the Society for the Preservation of Historical Relics in Gyeongju in the autumn of 1931. 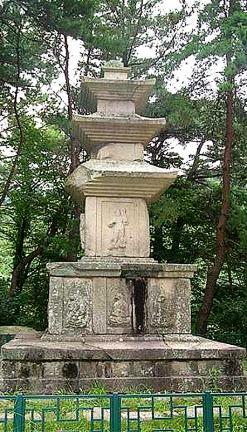 The two pagodas are identical in structure and style, with a double-tiered stylobate and three-storied body. The lower-tier of the stylobate is composed of eight side stones and eight capstones, while the upper-tier is composed of eight side stones and four capstones. The side stones of the upper and lower-tier stylobate each has two middle and corner pillars. On top of the lower-tier capstone is a double-tiered support for the upper-tier stylobate. 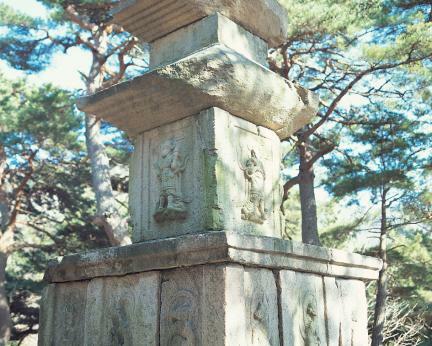 The figures of the Twelve Animal Deities of the Zodiac sitting on lotus pedestals are carved on all four sides of the upper-tier, in between the pillars. The figures have animal heads and human bodies, and are dressed in everyday attire, with their clothes blowing in the wind toward the heavens. 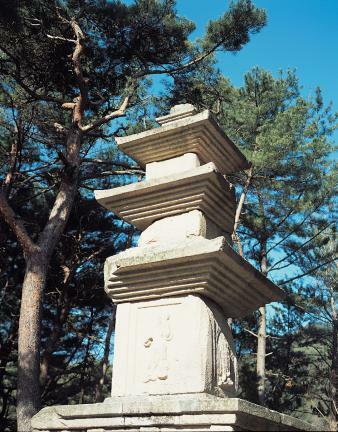 Each part of the body of the pagoda, from the core stone of the first story to the roof stone of the third story, is hewn from a single slab of stone. The first story has four corner pillars, and figures of Four Guardian Kings clad in armor and holding weapons, are carved on all four sides. The roof stones of each story are supported by five-tiered roof supports. 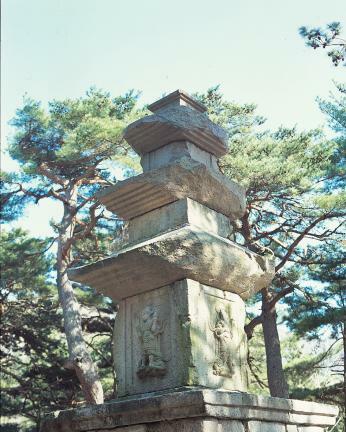 On top of each roof stone sit square double-tiered body supports. 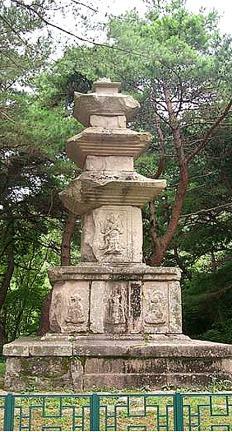 Only the finial base and the anghwa (upward-facing lotus ornament) remain of the pagoda’s finial. 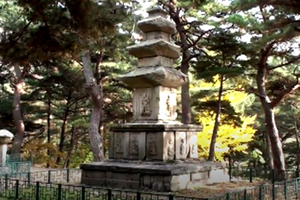 The twin pagoda’s sculptural styles, which are characteristic of stone pagodas of the Unified Silla Period, the cutting and trimming techniques of the roof stones, the artistic styles of the stylobate and the body, and the technique of piecing the stone blocks together all suggest that these pagodas were erected around the mid-8th century. 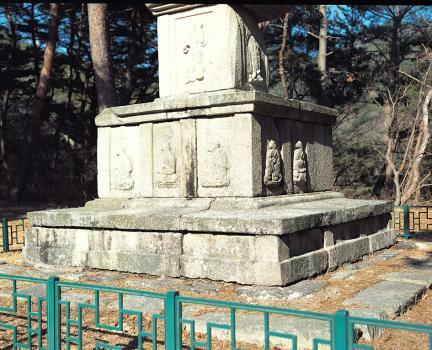 These pagodas were the first to feature carved figures of the twelve animal deities of the Chinese zodiac on the stylobate. Its sculptural technique and expressive styles are valuable for the study of art history.